Becoming fluent in a second language can be of great benefit in career and ministry. While Spanish is more common as a second language in our area, we were happy with the opportunity to study and learn French. French Essentials offers an online French course that provides a comprehensive study of the language for grades 3 – 12. We have been using French Essentials Full Access Online Program. 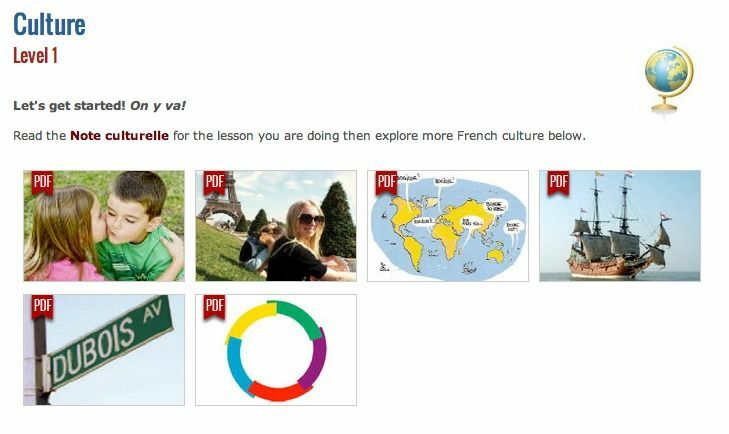 French Essentials is a complete French curriculum that you download to your computer. There are online aspects such as culture, online quizzes, test and other exercises. The course is broken down into modules. Modules 1 – 5 are currently available and Modules 6 -10 will be available soon. Each module is broken down into lessons. There are a few basic computer requirements such as Adobe Reader and Adobe Flash player. You can read more details about these requirements at French Essentials FAQ page..
How Do I Use French Essentials? One you have purchased the program, it is very simple and straight forward to use. If you are not sure of your student’s abilities, there is a placement test available. The first step is to go the appropriate module and begin with lesson one. The lessons need to be downloaded to your computer. 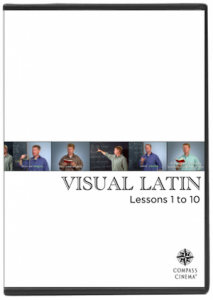 The lessons have links within them that provide audio and video. Written exercises are available that need to be printed. 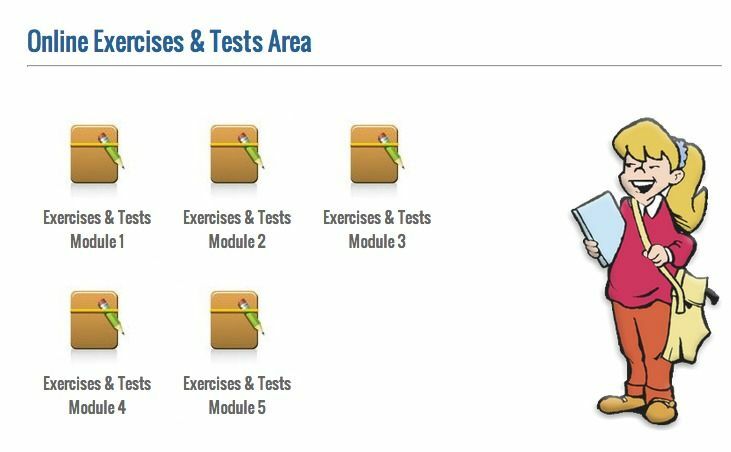 Throughout the modules there are tests and online exercises. The online exercises are flashcards. French on one side and English translation on the other. There are options on how to use the flashcards such as different games and speeds. The tests are a combination of fill in the blank and multiple choice. The test is taken online. One other aspect of French Essentials is the Culture section. The Culture section shares pictures and information about the French speaking areas. This section provides very simple and basic information. If older students are using this course, you may find that additional culturally study may be needed. There are two options for purchasing French Essentials. The first option is to purchase one module at a time. Individual modules are $69.95. You have 90 days to download the lessons and written exercises. Full Access to modules 1-5 for one year is $149.95. You have a full year to download the lessons and written exercises. You can view and listen to samples online to get a feel for the program. I have had two different groups of children using this program. My 4th and 6th grade students have been working with me in module one. We have been taking it slowly and steadily. They were initially excited about learning a new language but the excitement didn’t last. After several lessons, my students were not engaged. Often the audio was difficult for them to hear/understand. They didn’t find the content interesting. This approach to learning a second language doesn’t seem to work well for this set of children. Mary (8th) – I enjoyed the flashcards and you could change the settings to make them more challenging. It was nice that you could click on words and hear the pronunciations. That was helpful. The lessons were really easy. 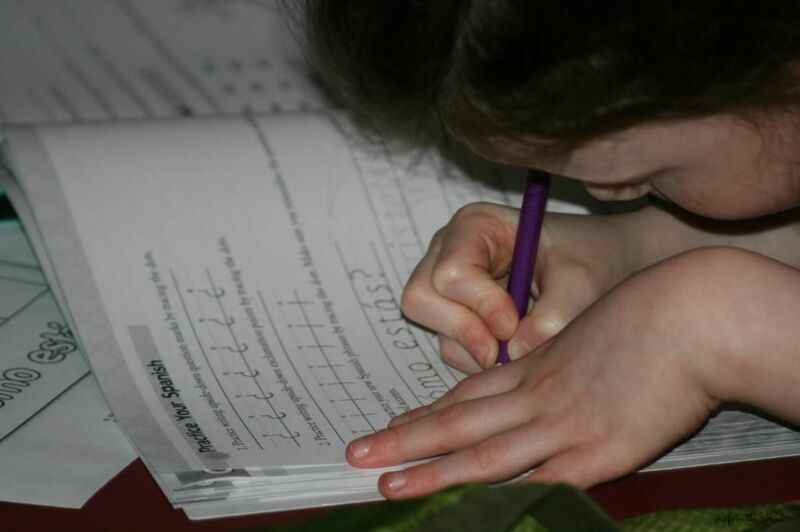 Bekah (9th) – The lessons were easy which isn’t surprising since they were for lower grades. The instructors were okay although a little boring. The videos just showed the instructors talking to the camera. I think it would have been better for them to talk to each other so you could see how they spoke to each other. There wasn’t really a way to make sure you understood the language . The exercises and test make sure you can write but not speak it. I don’t feel like I really learned much. I can write some but I definitely can’t speak it. One aspect that I find tedious about this course is the downloading of the lessons. I appreciate that we can download the lessons and exercises for future use. However, each lesson was downloaded individually and became a hassle. I agree with my oldest daughter on the video portions of this course. I didn’t find the videos to be engaging or interesting. I think this definitely would affect the success of younger students in using this program. While I’m not a song and dance fan, I do think this course needs to be more lively for younger students. My final thought is to spend some time at French Essentials and look around. They provide plenty of information on how to use the program, module content and FAQ. Reading other reviews from the Crew might be helpful as well. 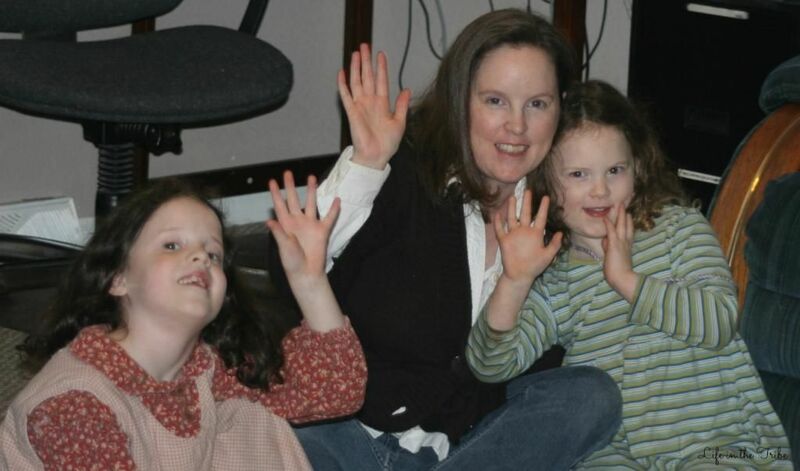 “a, be, ce, che, de, e, efe, ge…..” or perhaps, “If you are feliz and you know it, clap your hands”….these are just two songs that are being sung by my little ones (and an older one or two). Classical Academic Press sent us a wonderful product, Song School Spanish designed for grades K-3. We have used a few products by Classical Academic Press in the past and I couldn’t wait to introduce my young learners to Song School Spanish! Song School Spanish is a fun, energetic and interactive curriculum that will introduce your young student to Spanish and give them a vocabulary of over 100 Spanish words. We have been using three Song School Spanish items: Song School Spanish Teacher Guide, the Song School Spanish Student book and the Song CD that comes with the student text. These books cover 30 weeks of lessons (plus review lessons). Lessons cover topics such as Greeting Words, Family, The Body, Time to Eat, Manners and more! Also included at the beginning of the book is a pronunciation guide, scheduling tips and more. Song School Spanish Student text provides opportunities for the child to see the Spanish words as they are singing and saying them. While this is designed to be an introductory course, it is very thorough in its simple instruction. Small bits of grammar are included such as how Spanish is written with upside-down exclamation points or question marks. When to use “el” or “la”, stories like The Three Little Pigs with Spanish vocabulary and matching pictures to the Spanish word are examples of more learning. The writing required is not too strenuous. It provides just enough practice for copying or writing the language without being overwhelming. Review lessons are included in the Song School Spanish student book. The student reviews the vocabulary learned, reviews the songs and are encouraged to put on a play showing what they know. The text and pictures are in black and white and not “busy” at all. For the child who can easily be distracted, this simple layout is great. At the back of the book are cut outs to be used in various lessons. 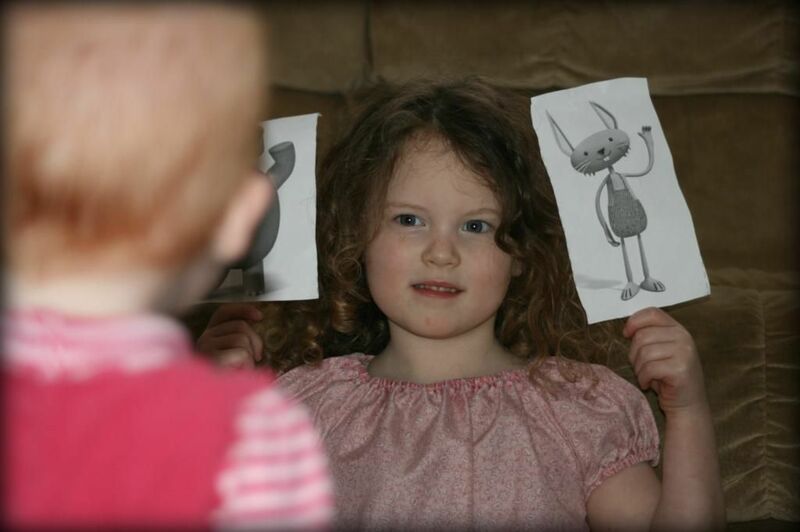 Hands on activities like making puppets really help to reinforce what they are hearing, saying, singing and writing. Included with the student book is a Song CD containing 42 songs that help build vocabulary. Songs use both English and Spanish to help build a connection between the words. Some of the music utilizes songs your children already know well like If You are Happy and You Know It, and incorporate Spanish into it (If You are Feliz and You Know It). The CD can quickly build that vocabulary! I find myself singing the songs! Finally we have the Song School Spanish Teacher’s Guide. The teacher guide includes, at a smaller scale, the student pages with answers. This allows you to easily guide your student through his activities and songs. At the back of the book, there are extra review pages for each lesson. 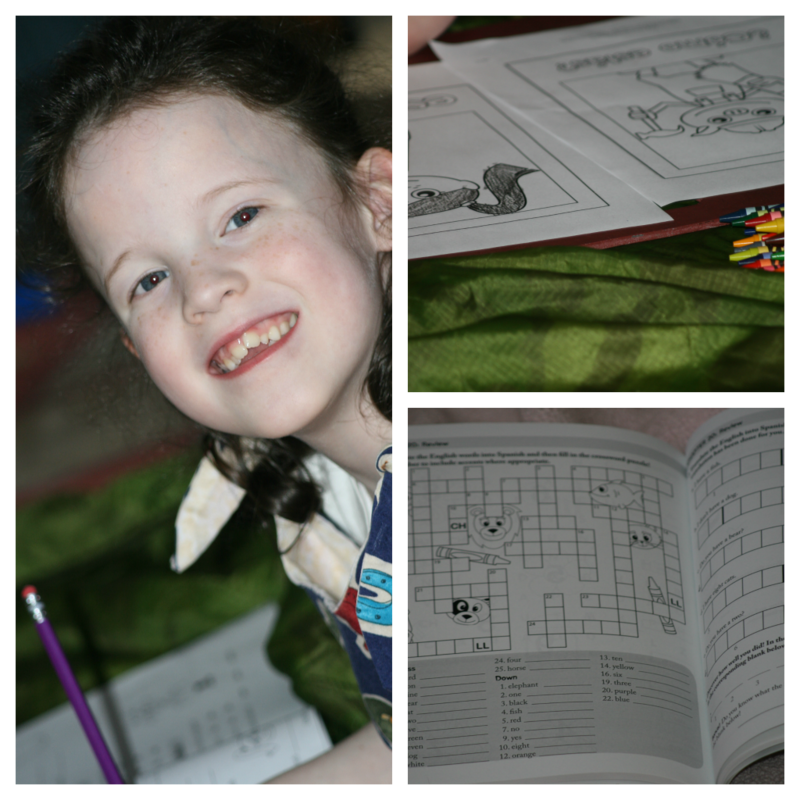 While they are great for extra practice, my daughter just enjoyed the pages for the extra fun. How Did Song School Spanish Work for Us? Once I have my older students busy at independent work, I grab Hannah, 7, and Sarah, 5, and we find a spot on the floor and dive into Spanish. Sometimes Sam, 3, will join in for a bit but I let his interest lead his participation. It is recommended to do 3 to 4 short lessons a week and that works out well for us. We start our time by listening to the song CD. The songs are fun and we love clapping and singing along. The Alphabet Chant gets practiced often; it is quite interesting with our southern drawls. Once we sing the songs and go over the chapter lesson, Hannah does a bit of the workbook. 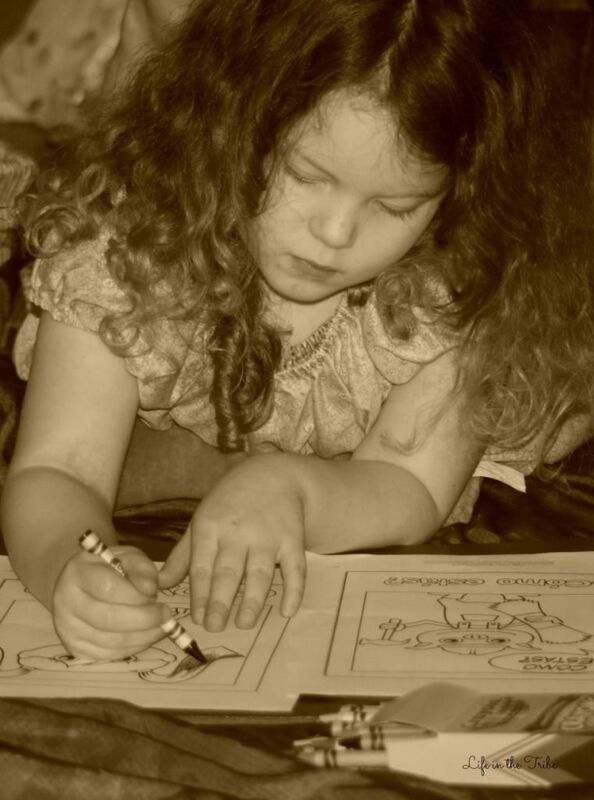 I don’t require Sarah to do any workbook writing but she does enjoy coloring while listening to the lesson. We generally spend about 15-20 min singing, talking, writing and coloring. 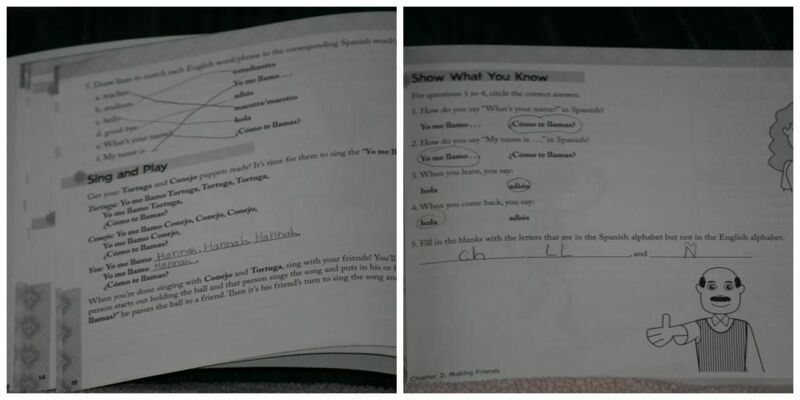 I really like that, because of the workbook, Hannah is learning to read the Spanish. We are enjoying our Song School Spanish time very much! Both Hannah and Sarah ask me when we are going to do Spanish during the week. This fact speaks volumes about Song School Spanish. Samples are available! It is so helpful to be able to “see” a product. Make sure to take a few moments and take a peek: Song School Spanish Student Text, Song School Spanish Teacher’s Guide, and samples of the songs are in a zip file you can download. Helpful for me is the Spanish Pronunciation Files that can be downloaded from Classical Academic Press. It can be challenging at times to say a word just right so to be able to hear it over and over is lovely. Coloring pages for each chapter of Song School Spanish are available for free. You just download and print as many copies as you need. (A favorite of Sarah’s.) At www.HeadventureLand.com, students can play an online game called FlashDash that reviews vocabulary. There are extras songs available for download as well. For those parents who may need clarification or help, they can “Ask the Magister” at ClassicalAcademicPress.com and get help from Spanish teachers. So many great things from Classical Academic Press! Other members of the Schoolhouse Review Crew had Song School Spanish or Bible curricula on the Old Testament. Take a peek at how others used these products in their homes! **Disclaimer: As a member of TOS Review Crew, I received a complimentary copy of these products. No compensation was made. The thoughts/opinions expressed in this post are my own.